A lava lake within Halemaʻumaʻu produced nighttime glow that was visible via HVO’s Webcam during the past week. The lava level fluctuated with a deflation-inflation cycle and varied between 35 and 45 m (115 and 150 ft) below the rim of the Overlook crater. On Kīlauea’s East Rift Zone, the Kahaualeʻa 2 flow continued to be active northeast of Puʻu ʻŌʻō. After the flow front stalled a month ago at a distance of 7.8 km (4.8 miles) northeast of Puʻu ʻŌʻō, surface flows have been active behind the stalled flow front, up to 7.5 km (4.7 miles) northeast of Puʻu ʻŌʻō. Webcam images indicate that small forest fires are continuing. There were no earthquakes reported felt on the Island of Hawai‘i in the past week. Visit the HVO website (hvo.wr.usgs.gov) for Volcano Awareness Month events and current Kīlauea, Mauna Loa, and Hualālai activity updates, recent volcano photos, recent earthquakes, and more; call (808) 967-8862 for a Kīlauea summary; email questions to askHVO@usgs.gov. 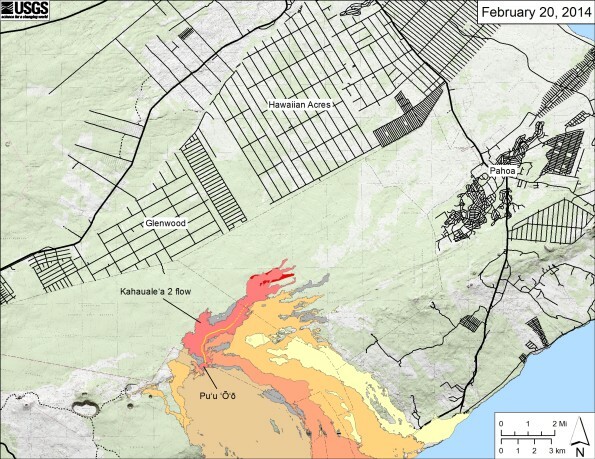 Map showing the Kahaualeʻa 2 flow in relation to the eastern part of the Big Island as of February 20, 2014. The front of the Kahaualeʻa 2 flow was 7.8 km (4.8 miles) northeast of Puʻu ʻŌʻō about one month ago. These forked fingers stalled during a prolonged deflation–inflation cycle (DI event) at Kīlauea’s summit around January 23. Lava flows have since resumed and are approaching the stalled flow front with a new narrow lobe (red), with the farthest active flow on February 20 at about 7.4 km (4.6 miles) from the vent. The area of the Kahaualeʻa 2 flow as of February 7 is shown in pink, while small areas of flow widening as of February 20 are shown in red. Older lava flows are distinguished by color: episodes 1–48b flows (1983–1986) are shown in gray; episodes 48c–49 flows (1986–1992) are pale yellow; episodes 50–55 flows (1992–2007) are tan; episodes 58–60 flows (2007–2011) are pale orange, and episode 61 flows (2011–2013) are reddish orange. The active lava tube is shown with a yellow line.